Welcome to Day 4 of the September Challenge. Click the link to find out more if you are just joining in. As part of my healthier lifestyle journey I have found that apps for my phone have helped me tremendously along the way. Most of the apps that I have found are free or are available to try free for a month with the option to purchase. 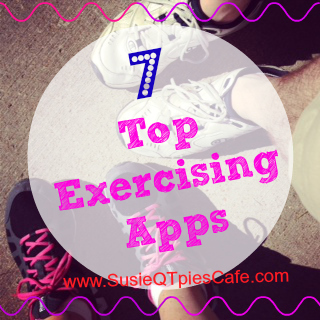 Here are some of my favorite health apps for exercise. I'd love for you to leave your favorites in the comment section below. Run Keeper is my current favorite app where I record or track my walking and running exercises that I do outdoors and indoors. It works great for track walking, elliptical and treadmill use. I love that it keeps track of my miles, calories, time,etc. The only downside for me is that it doesn't do so well with circuit training or my exercise classes. I manually add in that information. I also have it set to remind me to workout daily. I don't need it but I have it just in case I'm being lazy the app will tell me to go exercise. Here is a screen shot of my Elliptical use where it keep track of my best times, distance, etc. All my records are from the Fall. I need to get working harder on the Elliptical! LifeKraze app can also be used on your desktop. 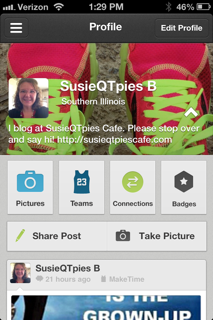 This app is a social media site for all things exercise. It unlike any of the other healthier lifestyle apps I have seen out there. It is my daily check in spot to make me accountable for exercising. It is also my go-to place for inspiration on my healthier lifestyle journey. Daily I get to see what others are doing, give them points for their accomplishments and leave comments that inspire them or praise them for their efforts. You give points, earn points and can use them to get discounts on healthy products. They also have badges that you can earn. I have learned a lot about exercise from all the other members and I daily feel inspired to do more and to keep on going. I started a new team on LifeKraze for MakeTime September Challenge. Once you get this free app let me know your user name or say HI to me there - follow the above link- and I'll add you to the team. Ease into 5K app is free then you have to pay. It is the only exercise app that I have paid for. I've tried at least 15 5K training apps and I love this one the best. Tap-A-Lap is a free app which keeps track of your laps for 1 mile at a time. I use this one when I'm inside my gym doing laps on the track because sometimes the gps tracking on my RunKeeper app doesn't work. I like giving the app a tap ever time I complete a lap. It tracks your stats and you get that at the end of your walk/run. RockMyRun has great music mixes made for running and exercising. They offer a wide variety of mixes from oldies, 70s, 80s, Pop, Hip-Hop, Latin and more. You can also pick the beat that you want. Check it out. Noom is just for android which doesn't help me since I got my iPhone last year. If you have an android phone check it out. It is great for keeping track of your exercising. PodRunner Shift- Love the podcast type music that you can download and get what beats per minute you want. Sometimes I just want a beat and no words in my music. So are you in? Are you joining in the September Challenge? By the way since I'm not big on rules, you can JOIN IN at anytime this month. So don't be discouraged if you are just finding out about this after the first. Just start where you are and move move move! Share this post and invite others to join in. I'll be sharing this on all my social media sites so follow me --on Facebook, Pinterest,Instagram, Twitter, Google Plus and LifeKraze with the hashtag. 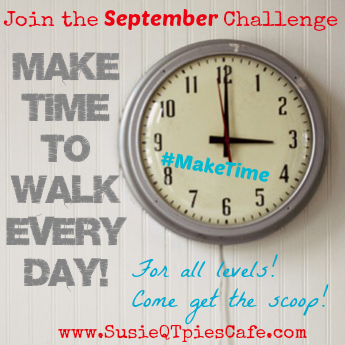 I will try and always use the hashtag #MakeTime when referring to this challenge so we can track our progress. The LifeKraze link will take you to my page and let me know that you have joined and I will add you to the MakeTime Team! Hello! I am downloading Rock My Run while I type this! I hope I like it! I have not yet done my walking for the day, but it's on my "to do " list! Happy National Macadamia Nut Day!